Parag Banerjee (MSE Ph.D. 2011), formerly advised by Maryland NanoCenter director Professor Gary Rubloff (MSE/ISR), joined the faculty of the Department of Mechanical Engineering & Materials Science at Washington University in St. Louis (WUStL) shortly after completing his doctorate in 2011. Prior to coming to the University of Maryland, he was a process engineer for Micron Technology Inc., where he developed DRAM, SRAM, and flash memory products. During his time at the Clark School, Banerjee was the John and Maureen Hendricks Energy Research Fellow and a Future Faculty Fellow, as well as the recipient of numerous honors, including the Microscopy Society of America's Presidential Student Award and the UM Office of Technology Commercialization's Invention of the Year Award for his role in the development of electrostatic nanocapacitors. He was a founding member of the university's Department of Energy Energy Frontier Research Center and the first to describe a self-powered, nanoscale photovoltaic circuit. MSE Professor and Chair Robert M. Briber describes his dissertation on the nanofabrication of supercapacitors as "a masterwork of nanotechechnology, materials processing and characterization." "Parag demonstrated exceptional breadth and creativity in research," says Rubloff. "He mastered a broad range of challenges, from the fundamentals of materials science and the design and fabrication of nanostructures, to innovative applications in energy storage and solar harvesting. His work on nanocapacitors was widely recognized by other research teams that followed, led to significant patent activity, and attracted tens of inquiries from companies and investors." "[My] experience at UMD was simply amazing," says Banerjee. "It gave me the right training to prepare myself for a career in academia. My advisor, his research group, the department and engineering school were all geared toward facilitating exemplary research, both in terms of providing infrastructure as well as mentoring and training. I was glad I was part of this environment." At WUStL, Banerjee is focusing on the synthesis of nanomaterials with tunable properties that can be integrated into devices such as biomedical sensors and energy storage and harvesting devices. 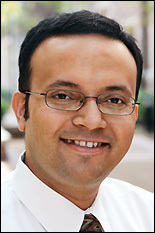 Banerjee's goals are to conduct world-class research and excel as an educator. "WUStL has a very vibrant engineering school and is in the midst of expanding to areas that excite me the most, including nanotechnology and materials science," he says, noting that it also encourages collaborations with researchers in the life sciences. "But most of all," he adds, "WUStL has great faculty and students who make [it] an intellectually stimulating environment for one to live, learn and grow in." Many thanks to our colleague Faye Levine of the Materials Science and Engineering Department who wrote this story for a series about recent MSE Ph.D.s.